Wedding speeches by your loved ones will definitely be a highlight of your reception. Regardless of what is said, the opportunity to see your love & relationship reflected back through the eyes of your loved ones is an extremely special moment! Who gives a speech at the wedding reception? Let’s start by reviewing who traditionally speaks at the wedding. Typically a welcome speech is given by one or both sets of parents. The point of this toast is simply to welcome and thank the guests for coming. The Best Man & Maid of Honor speeches follow, with the newlyweds wrapping it up by thanking everyone for coming. Before we go further, and important note – DO YOU! Everyone’s relationships & circumstances are so different. Please by all means make alterations to today’s show to fit your unique & special situation. Give advance notice to your speakers. Don’t assume that people know you want them to give speeches. Every wedding is different, and this may be totally new to your parents or wedding party members. We don’t want any surprises or last-minute panic attacks! Let your intended speakers know that you’d like them to share a few words at the reception, ideally a month or two in advance. Should we give direction about speech topic & length? The point of a wedding speech is to share a candid reflection of your love from the eyes of your loved ones. The goal should be to make everyone smile, laugh, and maybe shed a tear or two. Should you guide the wedding speech topic? Should you give prompts on the speech topic to your speakers? Depends. I would suggest letting them use their creativity and speak from the heart. If someone is really stuck on what to say, here’s a fun tip. Do a google search & find an article YOU like on creating a wedding speech, and share it with them. This lets you “kind of” be involved in the topic & tone of the speech. Direct your speakers to keep it brief. Suggest that they practice and aim for 2-3 minutes. This doesn’t sound like a lot of time, but when you’re the one talking for 3 minutes straight? It’s a long time. Also, multiply that by 4-6 people, and you’re looking at a pretty significant chunk of time dedicated to the speeches & toasts. When should the wedding speeches occur & in what order? The dinner seating is a natural time for the speeches to take place, when everyone is gathered & paying attention. Seize this moment! It’s really hard to get people back together and focused once everyone is up and moving around. Your parents should give their welcome toasts as soon as people are seated for the meal. The “host” of the wedding goes first – if there isn’t one delineated host, then choose randomly. Suggested format – one set of parents does the welcome toast, and the second set of parents does the blessing of the meal. Having a religious celebrant do the blessing? An alteration is to split the parents into 2 welcome toasts – one before the blessing, and one after the blessing. Once the welcome speeches and blessings have been done, your honor attendants or anyone else you choose will speak. A quick thank you toast from the newlyweds can happen at the end of the dinner, or during cake cutting. The point of this is a brief, heartfelt thank you to all of your guests for being there with you. I’m worried about inappropriate content – what should we do? You know your loved ones best. You know who’s got a potty mouth. Scan a room and you can probably easily choose the relative who’s likely to commit political and/or religious faux pax. If someone you’ve asked to speak at the wedding is in the “at risk” category, tell them that you’d appreciate that they keep the speech clean. Explain that you want to avoid hurt feelings or a completely offended grandma. If you have any doubt whatsoever that something truly embarrassing or hurtful will be said, and can’t trust that the potential speaker will respect your wishes, then they definitely don’t deserve to speak at the wedding. Explain to them in clear terms that they won’t be making a speech (if it comes down to this). How many wedding speeches is too many? 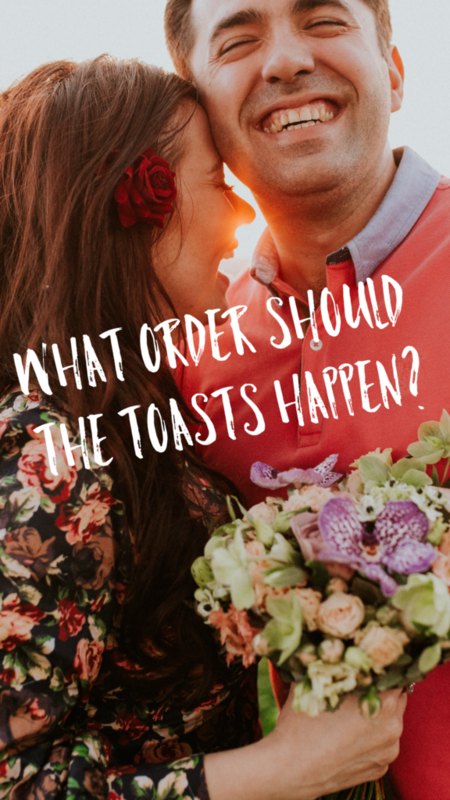 If you’re worried about length and number of people speaking, consider having some people speak at the rehearsal dinner, or even during the ceremony in the place of a “reading”. What if someone is terrified to speak & would rather pass? 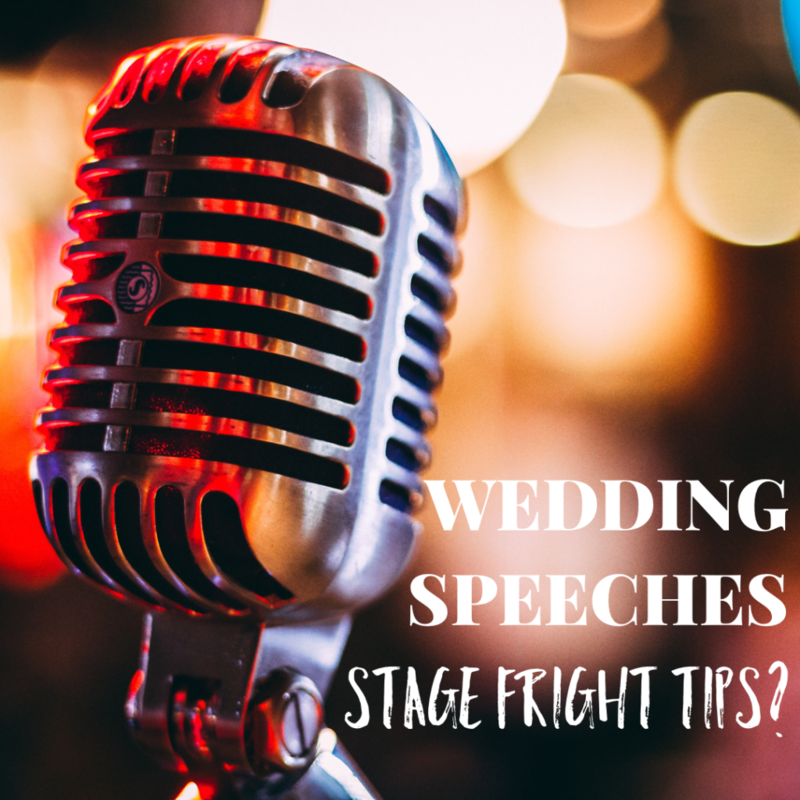 Know someone with terrible stage fright? This is another situation where the rehearsal dinner night may be more appropriate. The anxiety & nerves can be lessened with fewer people & a more intimate setting. If your proposed speaker insists that they just can’t do it, then respect their wishes, and don’t take it personally. Traditionally the first dances will be father daughter, mother son, and the couple. I would suggest spreading these out throughout the evening, rather than stringing them all together at once. I would also suggest that if you’re concerned about the length of the dances, you can combine father daughter with mother son, and the four of you dance together to the same song. If dancing with your new husband or wife in front of everyone feels nerve-wracking and embarrassing, then skip that too! I shared a few of my favorite, off-beat First Dance songs in this Instagram post. 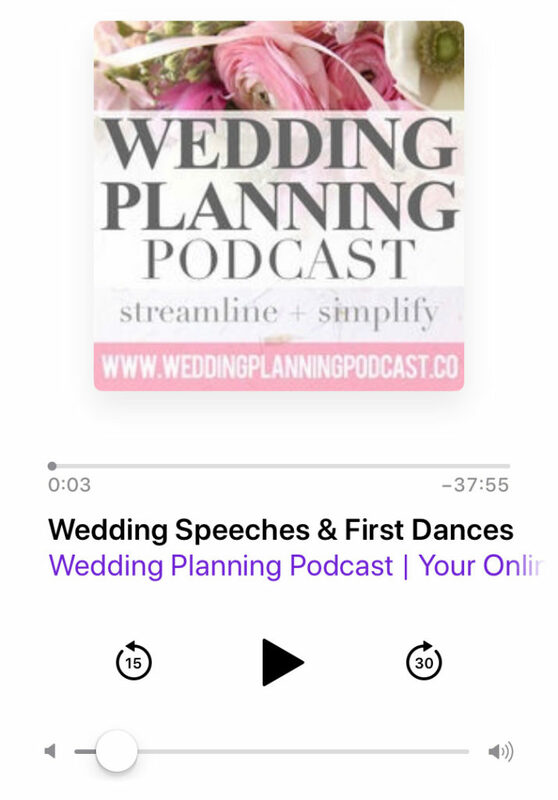 Be sure to follow along at @weddingplanningpodcast for future Wedding Planning Podcast behind-the-scenes news, special offers, & more! ← Bachelorette Party | Unique ways to celebrate, FAQ’s & more!